Ludington MI is a sailor's delight - a large, well-protected harbor, a busy commercial waterfront and lots of shops and restaurants in close proximity to the harbor. The great French missionary and explorer, Fr. Jacques Marquette died and was buried here in 1675. European settlement however did not really take root until the mid-1800's when the lumbering industry began to boom. As millions of board feet of lumber were produced, other industries and commercial ventures were attracted to the area and Ludington grew to become a major shipping port. By mid-20th century, Ludington MI was the largest carferry port in the world. A vestige of that remains today in the S.S. Badger, the last coal-fired ferry to still be operating. Today, Ludington is a major tourist destination. Visitors can enjoy miles of sandy beaches, forests, parks, outstanding fishing and a deeply-rooted maritime heritage. The approaches to Ludington MI are clear from all directions. Once inside the outer harbor, hold a course of approximately 098oT for .3 nm to bring you abeam the Fl GREEN light on the end of the north pier on your port side. Continuing up the inner channel .25 nm will bring you to the entrance to Ludington Municipal Marina on your port. Just past Ludington Municipal Marina, the channel turns starboard and if you follow it, will bring you to additional marinas. Rounding the bend, Crosswinds Marina, a private marina, will be on your starboard. Harbor View Marina will be on your port. Hold a course of approximately 155oT for .4 nm. You will come to a Fl GREEN light ("G1) marking the entrance to a large basin. Alter course to approaximately 085oT to enter the basin. Thompson Marina is on the north side of the basin, on your port bow. Further along the shoreline, Abrahamson Marina is on your port side, before the bridge (charted clearance of 12 ft/3.6 m). Ludington Yacht Club will be on your starboard as you enter the basin. In all events, keep a lookout for the S.S. Badger. This large car ferry makes four cross-lake round trips daily and her size makes her a formidable presence in the harbor. Her visibility and manoeuvering room are restricted and her twin screws create significant turbulance. 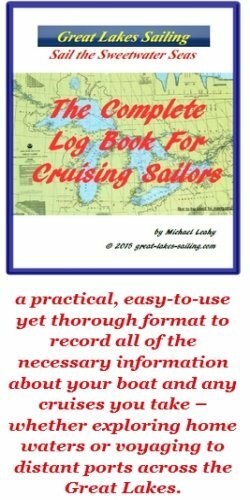 There are four options for a cruising sailor visiting Ludington MI. Ludington Municipal Marina is the first marina you will see when you enter the inner harbor. It is approxiamtely .25 nm in on your port side. They have approximately 150 slips with about half available for transients. There is a fuel dock (diesel and gasoline) and a pumpout station. There is water and power available at dockside. The marina has restrooms, showers and laundry facilities. Other amenities include a lounge, outdoor deck and picnic area. There are beaches nearby and the downtown is only a few blocks away. There is internet access. Harbor View Marina is past Ludington Municipal Marina, just around the bend on your port side. It has 160 slips with approximately 25 slips available for transient sailors. There is a fuel dock (diesel and gasoline) and pumpout station. There is water, power and cable TV available at dockside. Restrooms, showers and laundry are available in their lovely clubhouse. The clubhouse also has a fitness room, library, swimming pool, spa and ship's store. Other amenities include picnic and recreation areas, BBQ grills and internet access. Downtown Ludington is only a couple of blocks away. LYC is located up the channel, just to the east of the Fl GREEN "G1" buoy When you make your turn to port around this buoy, LYC will be on your starboard bow. LYC has 40+ slips and vacant slips are open to transient sailors, depending on availablibity. There is no fuel dock but there is a pumpout station. The clubhouse has a large dining room, bar, restrooms, showers and a full kitchen. Other amenities include picnic and BBQ areas and an outdoor deck. Thompson Marina is located in the basin on the north or port side as you proceed up, more or less across from LYC. They welcome transient sailors and have several slips set aside for them. They have a fuel dock (gasoline only) and pumpout station. There is water and power available at the docks. They have restrooms and showers. Other amenities include picnic and camping areas and a ship's store. Abrahamson Marine is located on the north side of the basin, just before the bridge. They provide repair and maintenance services for engines and mechanical systems, fiberglass repairs and electronics servicing. Best Choice Market and K & L Foods are both located downtown, within blocks of the harbor. There are several banks downtown, all with ATM's. West Shore Bank is the closest. Memorial Medical Center (231) 843-2591 is a full-service hospital, located 1.3 mi/2 km east of the harbor. Rite Aid Pharmacy (231) 845-7332 is located 1.3 mi/2 km east of the harbor, adjacent to the hospital. There is lots of choice when it comes to restaurants and pubs in Ludington MI, many of them in the downtown and harborfront area. Jamesport Brewing Co. is a local brew-pub with classic pub fare that can be enjoyed with live entertainment. PM Steamers is adjacent to Ludington Municipal Marina. It is very well regards by locals and the food is excellent - as is the harbor view. Scotty's offers good quality casula dining and is very popular. They will send a car to the harbor to pick you up! For 65 years, Old Hamlin Restaurant has been a favorite. They are well-known, especially for their home-baked goods. The menu features Greek and Italian specialties and they have won recognition for their breakfasts. For a great cafe experience, try Redolencia Cafe They roast their coffee on-site - and you know it the moment you walk in the door! There are lots more places to try, all within a few blocks of the harbor - no need to go hungry or dry in Ludington. Ludington MI is a great port to lay over for several days. There are miles of beaches, parks, hiking and biking trails. Free concerts can be enjoyed in the community band shell. Every July, Ludington MI hosts an annual Fine Arts and Crafts Show. August sees the 3-day Gold Coast Celebration with maritime exhibits, sporting events and lots of live entertainment. Looking through this Ludington MI tourism site will give you many ideas on getting the most of your visit.